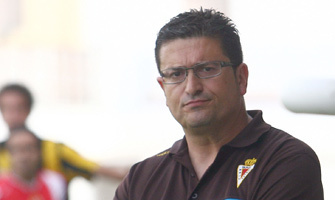 News today is that Real Murcia coach Iñaki Alonso's work has been recognized with the award of the Ramón Cobo prize. This is awarded by the the Managers committee of the Real Federación de Fútbol to a single coach from first, second and segunda B. It's like the managers vote for their manager of the year. I have to say it's very well deserved. Congratulations, Iñaki, getting Real Murcia out of Segunda B was a massive achievement given the amount of pressure. To have done it at the first attempt and with record numbers.....he deserves every plaudit he gets. Photo : Iñaki Alonso. He's magic, you know. Is the comment box working OK? I've posted things that havent appeared. Great award for Alonso, be interesting to see the papers' slant!! !